Do you need another charm for your charm necklace or bracelet? 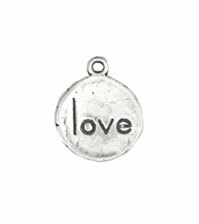 Our Silver Love Pea Charm is a great addition. The Love Pea Charm is a simple expression of love. This sterling silver charm will make a great addition to any charm bracelet or necklace. The charm is approximately 1/2" x 1/2". The charm will come with a jump ring to attach the charm to a necklace or bracelet. You will need to either take it to a jeweler to attach or if you have 2 needle nosed pliers, you can watch this video which will show you how to attach the charm. If you put the charm on a bracelet, it will need to be soldered on so it does not fall off.